In 1771 Joseph Banks and other wealthy collectors sent a talented, self-taught naturalist to Sierra Leone to collect all things rare and curious, from moths to monkeys. Henry Smeathman’s expedition to the West African coast, which coincided with a steep rise in British slave trading in this area, lasted four years during which time he built a house on the Banana Islands, married into the coast’s ruling dynasties, and managed to negotiate the tricky life of a ‘stranger’ bound to his landlord and local customs. In this book, which draws on a rich and little-known archive of journals and letters, Coleman retraces Smeathman’s life as he shuttled between his home on the Bananas and two key Liverpool trading forts—Bunce Island and the Isles de Los. In the logistical challenges of tropical collecting and the dispatch of specimens across the middle passage we see the close connection between science and slavery. We also see the hardening of Smeathman’s attitude towards the slaves, a change of sentiment which was later reversed by four years in the West Indies. 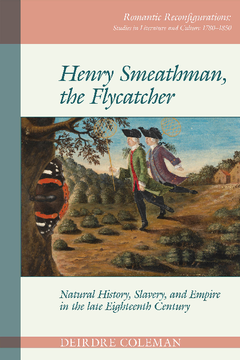 The book concludes with the 'Flycatcher' back in London - a celebrated termite specialist, eager to return to West Africa to establish a free, antislavery settlement. Deirdre Coleman is the Robert Wallace Chair of English at the University of Melbourne. She is the author of 'Romantic Colonization and British Anti-Slavery' (Cambridge University Press, 2005) and has recently published essays in the 'Oxford History of the Novel' (Oxford University Press, 2015), the 'Cambridge Companion to Eighteenth-Century British Women Writers' (Cambridge University Press, 2015), and 'Archives of Natural History' (Edinburgh University Press, 2017). Her research interests lie in literature, colonialism, slavery and natural history. Deirdre Coleman is the Robert Wallace Chair of English at the University of Melbourne. She is the author of 'Romantic Colonization and British Anti-Slavery' (Cambridge University Press, 2005) and has recently published essays in the 'Oxford History of the Novel' (2015), the 'Cambridge Companion to Eighteenth-Century British Women Writers' (2015), and 'Archives of Natural History' (2017). Her research interests lie in literature, colonialism, slavery and natural history.